It was yet going to be another fabulous day in Korea. WHY? Because today is the day where I will be seeing, breathing, eating and eating and eating all day long. To be honest, I love to indulge in eating quite a fair bit when I’m traveling which sometimes the husband gets a tad bit scared of my crazy sudden urge of appetite/eating patterns. Day 3 was planned to be the day where we head on over to Garosu-gil for cafe hoping. Doesn’t this look so good?!?! I was literally in love with the Latte here. 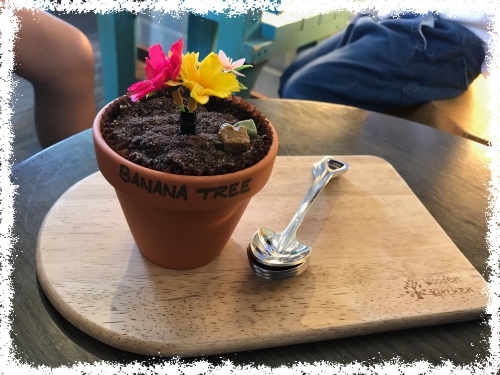 They serve this really cute looking plant like cake which my kids were both freaking out when I took my first bite into it. Next stop, we came across this really pretty and vintage looking cafe. It was really quite unexpected but with very few seats available inside this tiny cafe was half full with customers that we had to walk in to try. We were all definitely sugar high after this! As much as I would love to eat some more… the husband and kids were pretty much giving me the NO MORE EATING LOOK. We then headed back to MyeongDong and guess what… the little girl was so amazed by tornado potatoe that we got one for her to try. to my surprise…. she could actually finish the whole thing!!!! Once she was done… we headed on to explore the Duty Free Malls before heading back for the day.